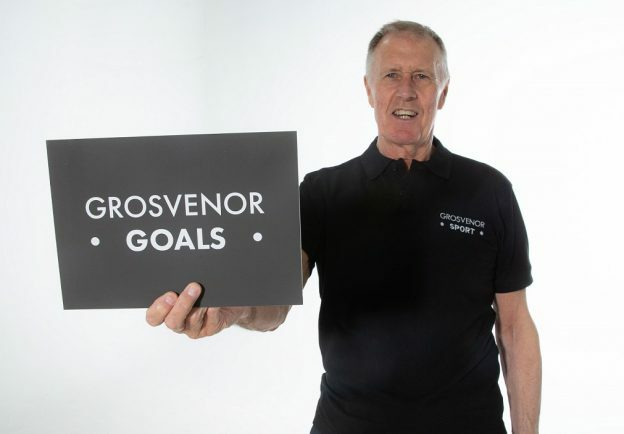 England World Cup winner Sir Geoff Hurst will pick 10 first goal scorers each week for the 2018/19 Grosvenor Goals campaign. 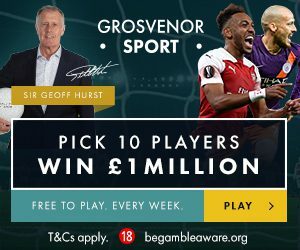 Grosvenor Goals gives users the chance to win £1 million if their 10 chosen players are all first goal scorers in a given game week. The free-to-play game will also offer £10k for anyone who predicts 10 anytime goal scorers from their selections, with a £10 free bet to those who successfully pick three or more first scorers each week. Sir Geoff will play his part too – if four or more of his selected first goal scorers hit the back of the net in a game week, all users who play Grosvenor Goals that week will win a £10 free bet. England’s 1966 hero shares his picks for game week 34. Heung-Min Son has stepped up magnificently in Harry Kane’s absence before and, with England’s captain possibly out for a while, Sir Geoff feels the South Korean will continue where he left off against Manchester City in midweek with another goal in Saturday’s early kick off against despondent Huddersfield. Ryan Fraser may only be Bournemouth’s third-highest scorer this season but, with 71%, he has by far the healthiest shots-on-target stats. Sir Geoff feels that the Scotsman will find the back of the net against a Brighton side who have shipped four goals in their last two games. With 13 goals and four assists this season, Gylfi Sigurdsson has been the most productive Toffee in front of goal and he will be looking to capitalise on Fulham’s leaky defence. The Cottagers have the worst goal difference in the league and Sigurdsson opening the scoring could well help provide his side with their fourth consecutive victory. Having committed his future to the club for a record fee before scoring in the FA Cup semi-final last week, Raul Jimenez will be brimming with confidence and Sir Geoff reckons he is set to draw first blood at St Mary’s on Saturday. Nuno Espirito Santo’s squad continue to outdo themselves this season, with Jimenez playing a pivotal role, while Southampton are not safe from the threat of relegation yet. Cardiff City loan midfielder Victor Camarasa has been turning heads this season and it’s rumoured that a few Premier League clubs will be vying for his signature come the summer. It’s not hard to see why, having scored twice in his previous three games for the Bluebirds, the Real Betis man has the ability to play in several midfield roles, and Sir Geoff believes he will be the man to open the scoring against Burnley. Marcus Rashford has shone for Ole Gunnar Solskjaer, scoring nine goals since the Norwegian’s appointment. Rashford has scored once every 206 minutes this season and Sir Geoff thinks he will score first as his side host a vulnerable West Ham side who will still be nursing their wounds after a 2-0 London derby loss against Chelsea last time out. Following Patrick Bamford’s second-half brace against Preston, which helped take his Leeds United side back up to second-place in the Championship, Sir Geoff feels he is likely to continue his form in front of goal by commencing the scoring on Saturday against Sheffield Wednesday. Sergio Aguero will undoubtedly be fuming from his Champions League penalty miss against Spurs in midweek, so Sir Geoff thinks the Argentine striker will be raring to make amends by getting the first goal at Selhurst Park on Sunday afternoon. With 29 goals in all competitions this campaign, Crystal Palace know that no matter his form, he is always a deadly threat. Mohamed Salah was highlighted for all the wrong reasons after his side’s European victory over Porto during the week, having escaped a red card for a dangerous-looking tackle on Danilo. Still in contention for this season’s golden boot, though, Sir Geoff reckons the Egyptian will end up in the headlines again, but for all the right reasons, this weekend. Troy Deeney will still be on cloud nine after helping his Watford side to the FA Cup final last weekend with an added time rocket of a penalty. The 30-year-old is the club’s top scorer this season and Sir Geoff believes he will add to it on Monday night, undoubtedly bolstering the chances of achieving a result against a visiting Arsenal side.